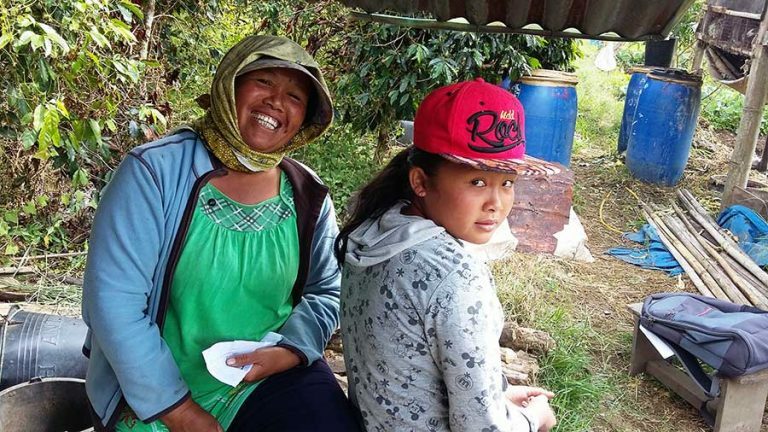 Nurida Girsang works with great dedication as a farmer in her organic farm and as a mother in her organic family. After 25 years, Nurida Girsang, 45, finally decided to cut unproductive coffee trees in her ancestor land and turned it into organic farming. This decision was agreed together with her husband, Jusen Munthee, 50, to overcome a challenge of household economic conditions. Due to the low coffee yields, the family had difficulties in affording to pay for their children education, health care and household bills. The mother of three, besides working in her farm, had to take up extra jobs to bring additional income to the family. It was sad for Ms. Girsang to not be able to focus on her children and many times she have to leave them behind. After meeting with agronomists from Taman Simalem Resort (TSR) three years ago, her life started to change. 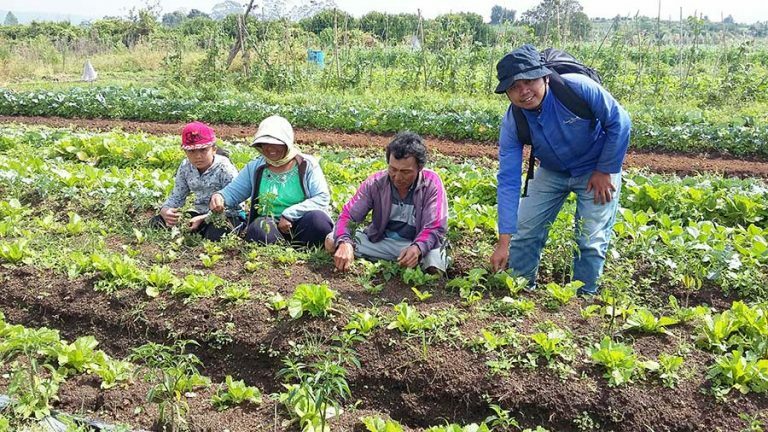 In 2014 when the staff from the resort came to give technical assistance on the green farming to her neighbour farmers who supply organic products to the resort, Ms. Girsang thought about doing the same. She discussed with her husband, and with his affirmation she began to experiment the organic farming practice in part of the land. 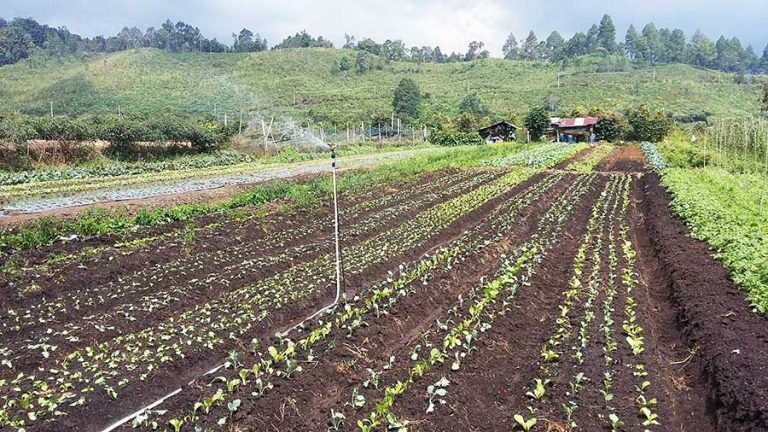 Over the six-month period of the green farming practice, Ms. Nurida and her husband learnt about the use the compost, organic fertilizer, and bio-control agents to control pest and diseases in crops. Based on the organic farming principles, the couple had to learn how to best conserve and improve the environment including soil health, plants, animals, people and the earth as one unity and inseparable. 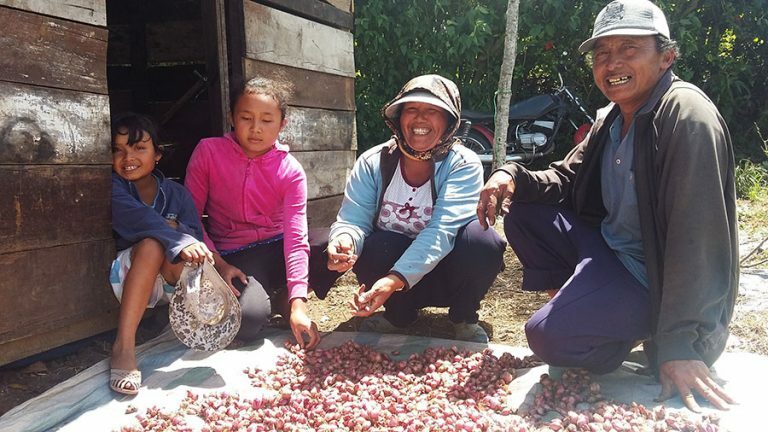 Most importantly, for the farming family who lives under the financial limits, Ms. Nurida and her husband also had to be assured that this organic farming practice must bring them sustainable income. “The coffee trees provided us a tiny income (approximately US$150 per month). But, based on the calculation and evidence on our small field trial of organic farming, I brought it up to my husband that we should change from our convention farming to this new practice, and he agreed and has supported me fully. “Then, we did the land clearing. We cut the coffee trees in our 0.56 hectare land and replaced them with seasonal crops and began to work intensively in our organic farm with technical assistance provided by the TSR’s agronomists,” Ms. Girsang said. Started planting with five types of vegetables in 2014, currently the family has grown as many as 27 types of vegetables including red chili, mustard, lettuce, red spinach, green spinach, tomato, potatoes, eggplant, long bean, onion, and cabbage. The family income has also increased significantly from less than US$ 150 per month to US$173 per week, which is US$ 692 per month in total. Upon the TSR’s centralized contract farming scheme, farmers are defined as partners in business. In this scheme, farmers oblige to supply the organic produces in volume and qualities as specified, and the TSR obliges to take the products that farmers produce, and realise payment as agreed. The TSR provides embedded services such as inputs including seeds, fertilizers, bio-control agent products, and non-financial services including technical assistance, training, and product pick-up during harvesting time. TSR comes pick up the yields directly at farm gates three times per week on every Monday, Wednesday, and Friday at the set price agreed before planting each type of vegetable. The payment is made on a weekly basis through a bank transfer directly to farmers’ bank accounts every Monday. As a woman, working in the farm and taking care of the four children, it is not easy. Ms. Nurida has four daughters at the growing ages of 17, 15, 11, and 8 years old. “I have to wake up early in the morning at 5 am to prepare breakfast for my children before they leave for schools, and from 7 am to noon time I work in the farm, then I prepare my children’s lunch as they come home to eat. I go back to work in the farm again at 2 pm and continue till 5 pm. This is my daily routine, except on Sunday that I go to Church, and Thursday at 8 pm that I have my religious social activities,” she said. When Ms. Girsang joins the social activities in her community, she shares her experiences in organic farming with the community members to encourage them to enjoy safe and healthy food as she and her family does. Ms. Girsang said with the existence of market guarantee, farmers feel confidence in planting and production processes. “When we know about the price and the demand from the market, we can plan for production, estimate income and profit from the farm, and allocate the revenue to fulfil the household expenditures including daily household needs, schools, social activities, and health care,” she said. And with the economic security, Ms. Girsang said she feels confidence when socialising with the members of her community. The contract farmer scheme and the market guarantee of TSR is a security system to drive the efforts of famers on organic farming production and decision. It provides a feeling of certainty to farmers. With input supplies, advisory, and guarantee of the market farmers can focus mainly on the production. Ms. Girsang also told that every month she together with her husband and other members of the TSR Organic Farmer Group were invited to join several training as part of the continuing improvement of production process, products quality enhancing, product safety, as well as motivation for farmers on the organic farming practices. 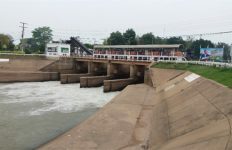 This is provided as part of embedded services according to an agreement that agreed between farmers and TSR, which emphasises on the improving conditions of the production and marketing. 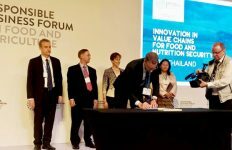 The contract farming scheme is established with support of ASEAN Sustainable Agrifood Systems (ASEAN SAS) project in Indonesia through Public Private Partnership (PPP) between GIZ and TSR along with the Indonesia’s Ministry of Agriculture, University, and Research Institutes. 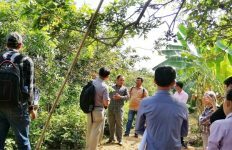 ASEAN SAS provides and facilitate technical assistance to TSR and farmers such as in technology production of compost and bio-control agents. 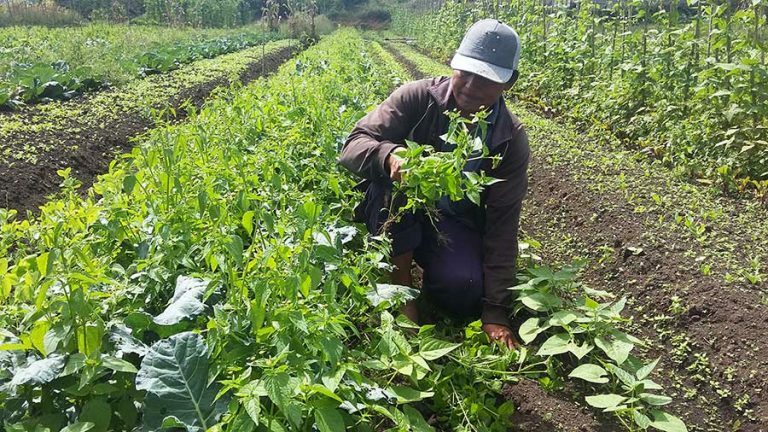 Ms. Girsang and her husband are planning to turn more parts of their land and rent their neighbouring farm to expand their organic farming if the market demand continues to be developed. If Ms. Girsang still kept the unproductive coffee farming, she might have to sacrifice the children’s education to fulfil the basic needs of the households. Because of the organic farming, she can introduce the importance of agriculture and food and nutrition security to her daughters. She can tell her daughters with proud on the roles of woman that with the serious efforts, woman can contribute greatly to the family’s economic stability, to food and nutrition security at both household and national levels, while taking best care of the family members. “I can tell my daughters now that woman can play a role in changing the situations for better. In our Karo, at the beginning of marriage, we receive advice about the role of man and woman in the families that we together should support one another to build a better household life, and this can be done when there is the economic stability in family. “I believe that effort is part of the success factor on the organic production and life as much as determination to overcome the challenges. Woman can be playing an active role in enhancing the living conditions of the family,” said Ms. Nurida. Ms. Girsang’s success has also inspired a group of 14 women named ‘Kelompok Tani Bunga Mawar’ (Roses Women Farmer Group) who does conventional monocrop of red chilli with the use of chemical. They plant the red chillies covering an area of 20 ha, and unfortunately that the prices during harvesting season has fallen, due to an oversupply in the market. The success of Ms. Nurida farming has inspired them to follow the establishment of organic farming in cooperation with TSR. “We have offered to establish cooperation, but the TSR is looking for and developing new markets for organic vegetable products,” said Ms. Kristina, 49, a leader of the group. “Woman can play an important role in the process of stabilizing food and nutrition at both household and national levels. Traditionally, woman only plays common roles on domestic household. Many times, we are forgotten in many of development programmes. People ignore us. They ignore us in their technical trainings and our roles in decision making for the household. 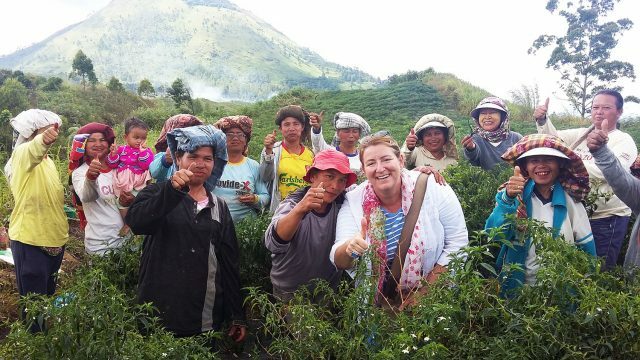 Woman can perform activities to fulfil the value chain in agriculture including production, post-harvest, distribution, and consumption” said Ms. Nurida Girsang, 45, contract farmer of Taman Selamen Resort in Merek Hill, Lake Toba, Karo District, North Sumatera, Indonesia.